The bacterium Burkholderia pseudomallei causes melioidosis, a rare but serious illness that can be fatal if untreated or misdiagnosed. Species-specific PCR assays provide a technically simple method for differentiating B. pseudomallei from near-neighbor species. However, substantial genetic diversity and high levels of recombination within this species reduce the likelihood that molecular signatures will differentiate all B. pseudomallei from other Burkholderiaceae. 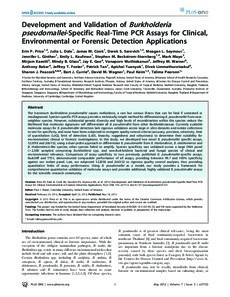 Currently available molecular assays for B. pseudomallei detection lack rigorous validation across large in silico datasets and isolate collections to test for specificity, and none have been subjected to stringent quality control criteria (accuracy, precision, selectivity, limit of quantitation (LoQ), limit of detection (LoD), linearity, ruggedness and robustness) to determine their suitability for environmental, clinical or forensic investigations. In this study, we developed two novel B. pseudomallei specific assays, 122018 and 266152, using a dual-probe approach to differentiate B. pseudomallei from B. thailandensis, B. oklahomensis and B. thailandensis-like species; other species failed to amplify. Species specificity was validated across a large DNA panel (>2,300 samples) comprising Burkholderia spp. and non-Burkholderia bacterial and fungal species of clinical and environmental relevance. Comparison of assay specificity to two previously published B. pseudomallei-specific assays, BurkDiff and TTS1, demonstrated comparable performance of all assays, providing between 99.7 and 100% specificity against our isolate panel. Last, we subjected 122018 and 266152 to rigorous quality control analyses, thus providing quantitative limits of assay performance. Using B. pseudomallei as a model, our study provides a framework for comprehensive quantitative validation of molecular assays and provides additional, highly validated B. pseudomallei assays for the scientific research community.